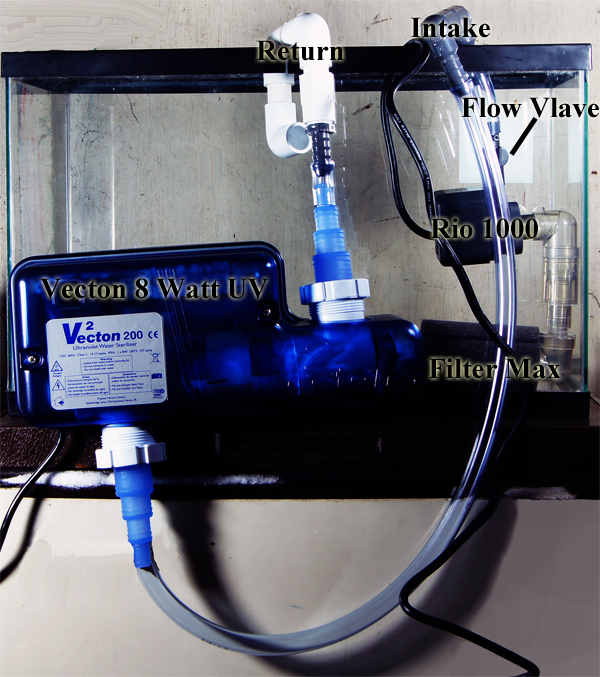 Aquarium UV Sterilizer Ideas; Filter Combinations, etc. .
Aquarium UV Sterilizer Ideas; Filter Combinations, etc. This post/article is intended to provide some unique (or "outside the box") combinations of different ways to connect a TRUE UV Sterilizer to an aquarium. Not one of the Internal or Hang On Back UVs flooding the market from China that can at best perform clarification, not true level one sterilization. Most aquarium /pond keepers are aware of the use of canister filters or sump pumps for aquariums or pressurized filter or similar pond filters for ponds. 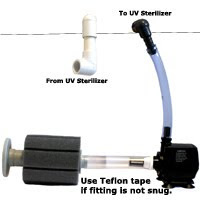 These are the most commonly thought filters for connection of TRUE UV Sterilizers. Hopefully these ideas I will present will be food for thought for those sitting on the fence as to whether a True UV Sterilizer is feasible for their pond or particularly aquarium. Even small aquarium keepers (such as a 20 gallon) miss the benefits that a UV Sterilizer provides due perceived high costs or filters that cannot accommodate a UV Sterilizer (such as a Power HOB filter like an Aqua Clear). Often even a small aquarium keeper can spend more on medications or lost fish than the cost of a UV Sterilizer(& this does not even factor in the heartbreak many feel at the loss of a finned pet). This is not to say that a UV Sterilizer will stop all losses, however I can say emphatically after 30 years of testing and using UV Sterilization in many different aquariums (including controlled tests) that a properly installed and well designed UV Sterilizer will lower the incidence of disease, & increase longevity and over all health by killing many disease pathogens in the water and by improving the Aquarium/pond Redox Balance. This first combination can be used with many power heads such as the Via Aqua 1300/ SunSun HJ-1542 and Sponge Filter such as the Hydro Sponge #3 pictured here (you can also remove the base for better aesthetics, it was left on in this picture to avoid any confusion). This combination also employs a return and intake adapter. 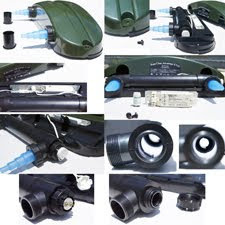 A larger pump such as the Rio 1100 or even the "high end" Rio HF line of Pumps can be substituted for a larger aquarium or pond, as well the Hydro Pond #4 is well design for this application too without need for adaptation for most pumps (see the small inset picture). This combination is quite straight forward for use in small aquariums (or even patio ponds that have "walls"). This picture demonstrates a SunSun JP-23 along with a Hydro Sponge #3 Filter and return and intake adapters. Obviously other power head brands can be adapted as well and although one can purchase the return/intake adapters (see the link in the previous sentence), these can also be a simple DIY project too. Finally, this combination incorporates the premium, high dwell time Vecton UV for unsurpassed UVC Sterilization up to level 2. The picture to the left picture demonstrates a Vecton 8 Watt UV, with a Rio 1000, Filter Max #3 Pre-Filter, 5/8" Tubing, and an Intake and Return Adapter. The small valve included with the Rio 1000 can be used to slow the flow during critical times when a higher level of UV Sterilization is desired (the Rio 100, 1700 also include this valve for larger Vecton installations. This last combination is the most effective and yet it is still a very simple application for those not desiring the use of a canister filters or one of the cheap Chinese Internal UV or Hang On UV" imports flooding the market that not only are not all that reliable or durable, but can barely perform UV clarification, yet alone important level one sterilization (or level 2). When using a diverter valve with a UV sterilizer in a sump application: Where should the water that is diverted through the UV sterilizer be returned? Return it back to the sump or to the aquarium? Either way, this by-pass method doesn't seem like it would do a good job of turning over ALL aquarium water through the sterilizer in a timely manner. I have a 200 gal aquarium with a sump pump that is actually fuctioning at approx. 600 gph after all loads. Would I be better off to go with something like the ViaAqua Terminator 36 watt sterilizer and just run it in line after the filter with no by-pass? The diverter should return the water directly to the aquarium (or pond); this way the turnover is adequate, depending upon the bypass flow of course. If the diverter is back to the sump, you are correct in stating that the turnover would be poor. For sterilization and Redox I generally aim at a turn over of 1-2 times per hour. 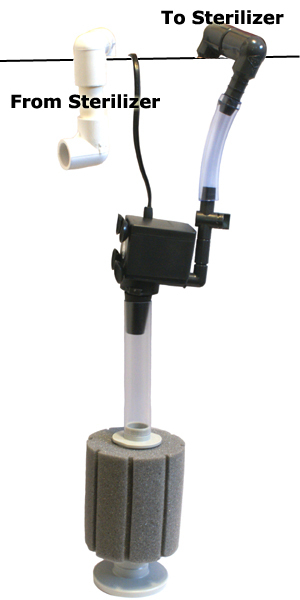 As per going with a straight flow and a larger UV such as the Terminator 36 watt, this would certainly give you better sterilization qualities and with your size aquarium a turnover of at least 2 times per hour (keeping in mind that a 200 gph pump will not put out this flow rate once head pressure is applied by lifting from a sump). The idea of using a diverter is in part to allow for a smaller UV with larger pumps, as I have seen and read countless times where someone used a 5 watt UV with a 500 gph flow and then made a blanket statement that the UV Sterilizer did not work or is useless; when properly installed a diverter can make a small UV work for larger aquariums or ponds provided the turnover part of the equation is addressed as well.